It’s Time to Enjoy the Pool!! POOL IS OPEN FROM DAWN TO DUSK – The pool may only be used during normal operating hours. Absolutely no admittance any other time. SWIM AT YOUR OWN RISK. 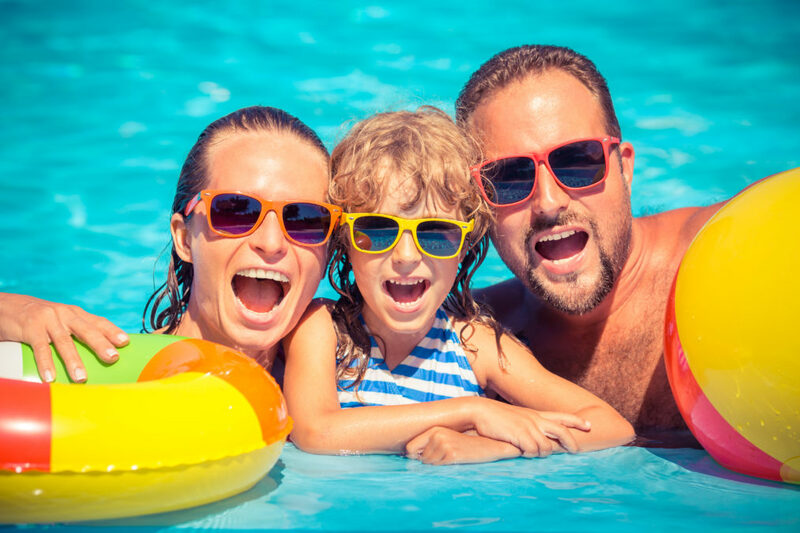 All persons using the pool or pool area do so at their own risk, as management does not assume responsibility for any accident or injury about such use. The pool may be closed at any time due to mechanical breakdown, weather conditions or any operational difficulty at the discretion of the manager. Prior notification of pool closing will not be given. Anyone caught in the pool area when it’s not “open” will be treated as a trespasser. SMOKING ONLY ALLOWED IN DESIGNATED SMOKING AREAS! Dressing MUST be done in apartment. Guests – Each household is allowed a maximum of two guests at any one time if, in the opinion of the manager, there is sufficient room in the pool at the time of the request. Resident must accompany the guest always. Management, at its sole discretion may determine the pool overcrowded. If this is the case, all guests will be asked to leave the pool. Residents have priority in the use of the pool. All guests must check in at the office with the resident. Children 15 and under must be accompanied by an adult resident (over age 18). Residents are responsible for all actions of their guests. The cost of any damages will be charged to the responsible party (resident). LITTERING WILL NOT BE TOLERATED AT THE POOL. If you choose to litter, you will be asked to leave and repeated incidents will incur a fine and/or you will be banished from using the pool. The owner and/or his agent will not be responsible for loss or damage of any personal property. No wheeled vehicles are permitted in the pool area. NO PETS ALLOWED INSIDE POOL AREA. ALCOHOL WILL NOT BE ALLOWED IN THE POOL AREA. NO EXCEPTIONS, DON’T ASK. NO RUNNING, PUSHING, OR WRESTLING. Water ball will be permitted until it becomes a problem for others. If you are asked to stop playing by either an employee or other resident, please do not be offended. Also, if you see that there are people coming to the pool, please be considerate and wait until the pool is empty before you start again. We want everyone to have a good time at the pool. If it becomes a problem, all water games must come to an end. Admissions shall be refused to anyone with skin abrasions, colds, coughs, inflamed eye infections, or those persons wearing bandages. NO ABUSIVE OR VULGAR LANGUAGE will be tolerated. NO FOOD, CANDY OR GUM AT/IN THE POOL. Small snacks and can soda are an exception. For your safety, do not swim for at least 20 minutes after eating. Street footwear will not be permitted on the pool deck surface. NO TOYS IN THE POOL. Floatation devices are an exception until they become a problem for others. Persons using this facility do so at his/her own risk and in conformation with all written and posted rules and regulations. Any person, resident or guest, may be barred from the pool and pool area at the sole discretion of management for violations of rules and regulations, or for any other action which might constitute a hazard to others or a danger to the property. If you or your guests are disrupting the other residents, you will be asked to leave and your pool privileges may be suspended indefinitely. If you refuse to leave when asked, or return without permission, you will be trespassing. The residents and their guests agree with the management and/or owners, for and in consideration of the use of the pool as an added facility, to make no claims against the management and/or owners for any loss or damage to life, limb, or property.